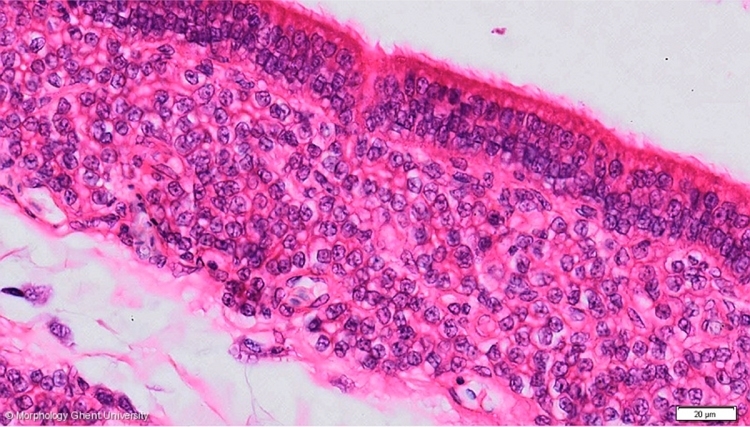 The epithelium of the uterus is a simple to pseudo-stratified cilindric ciliated epithelium. Two types of cells are present: the apical cells or ciliated cells have a centrally positioned nucleus and apical secretion granules (who play a role in the secretion of the protein part of the egg shell matrix). The basal cells have a basally lying nucleus and also have apical secretion granules (who play a role in the secretion of the mucopolysaccharide part of the egg shell matrix). The uterus glands (glandulae uterinae) secrete the anorganic part of the egg shell. Uterus glands are tubular glands that fill the l. propria completely. On this micrograph the gland cells look polygonal, they have a rounded nucleus and a rather vacuolised cytoplasm. The glands are in the phase after egg passage (after secretion of the granules). Sporadically, glandular ducts opening into the shell gland lumen can be seen.